Incomedia WebSite X5 is an offline Web Design Software for creating web pages and sites. With WebSite X5 users don’t need to know how to code in html or css (although it is possible) to create stunning web pages with impressive web galleries, function rich forms or even complete e-commerce shops. Creating new, or editing existing pages works completely offline on the users computer, you only need to connect to the internet to upload the ready content. As you will see WebSite X5 is an interesting software for anyone who wants to create professional looking web pages with modern features like parallax effects and responsive design or even a complete e-commerce shop without spending hours of learning html and css coding. And not everyone has the time to spend hours of manual coding, some just want to get on with their projects. If you are one of them you should definitely give Website X5 a look. WebSite X5 comes in different versions, the most popular versions are WebSite X5 Evolution and WebSite X5 Professional. Professional contains some advanced functions like Database-Integration and most interesting function for many is the integration of adding e-commerce solutions. The professional version targets businesses and online shops. The newest version 15 of WebSite X5 includes a 12 Month Update-Protection plan which means you can profit from every new feature that Incomedia brings out and receive the new features immediately. It is important to mention that WebSite X5 is nevertheless not Subscription-Software, you can use the version you have as long as you want without paying extra every month. You can, however, prolong the Update Protection plan after 12 months if you want to continue receiving further new features and updates. If you buy WebSite X5 you also get a free domain and 12 months free web hosting. Starting a new web page with Website X5 always starts with choosing a template, so basically Step 2 is your first step. WebSite x5 includes more than 500 Design Templates so you don’t need to start from scratch. You also have the possibility to buy commercial templates on top. To do so, you need credits which you can buy from Incomedia for a very reasonable price. Occasionally you can receive free credits as part of a special offer when you buy the program. You can of course adjust the template you have chosen, not only can you replace pictures but also a lot of other settings including layout, for example where you want to place your side menu. Once you have chosen a template and you click on “Step 2 Template” on your WebSite X5 Navigation panel on the left you find a surprisingly extensive number of available options. One of the nicest things you will notice is that website x5 supports responsive design, so that you can create web pages which will adjust to the form factors of any hardware, or in other words, Website x5 is mobile friendly. Once you have chosen your template you can start setting up your basic page information. WebSite X5 supports SEO friendly pages, so you can fill out for your start page and every other page things like title, description and tags in the section at this point in Step 1 Settings. Step 3 Map is basically setting up your site map which contains the structure and all the pages of your web site. Here is where the structure of your web site menu is organized and determined. Under this section it is also possible to add new pages at any time, move them to a different menu positions or delete pages. Access to each page for editing is made here by a simple double click on the page title making the building of your web site clear and uncomplicated. The site map is the center of your project. 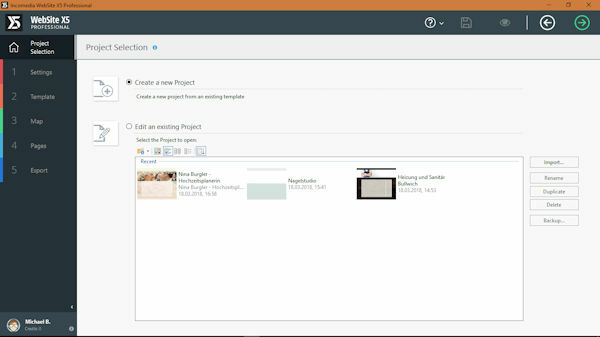 Step 4 Pages allows you to add and edit the content of your individual pages with the support of page components. WebSite X5 works with a grid structure layout of rows and columns which allows you a lot of freedom for your page layout. 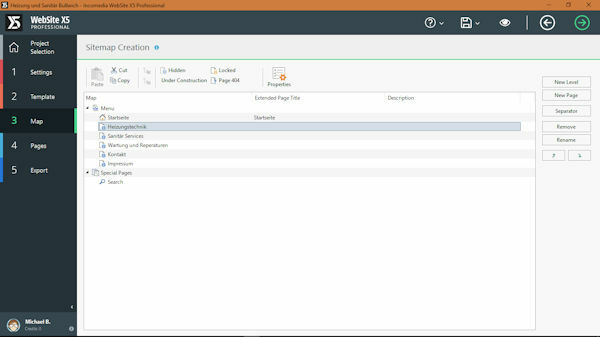 You can resize columns and rows, add and delete extra rows and columns per click. Adding page components is easy drag & drop. You can also span components over multiple rows and / or columns per drag and drop so that you get for example a long single column and next to it a column with 2 rows. Each grid cell can contain a different kind of page content component. The most simple one is text, but there are many more to discover: HTML-Code, HTML5 – Animation, Tables, Images, Video and Audio and so much more to assist you in creating a feature rich, modern web site for everyone. Each component has its own array of settings and options. You don’t need to be a specialist to make really great pages. Using the basic text component allows you to write you content in the same way as using a word processor, but you will also be able to use html code by clicking on the “Enable HTML” Button. Very recommendable as a way to insert some extra SEO-friendly Tags and hard coding. The image component allows not only the insertion of images, here it is also possible to do simple editing, add effects and masks to your images with a few simple clicks. There is a lot to discover and over time it becomes apparent that although the WebSite X5 interface looks very clean, easy to follow and understand that it is also a real bag of surprises because it offers everywhere an enormous amount of functions and features enabling you to create great web sites with a big feature set. Once your web site is created, Step 5 Export is the section where publishing to your online server via FTP takes place. You can edit your web pages and update your online site at any time in both full or incremental update sessions. WebSite X5 is a feature rich, easy to use offline web design software which gives everyone the possibility to design and create stunning web sites without knowledge of coding in html or css. Some more advanced functions like parallax, building up an e-commerce shop or setting up the responsive design may need a bit of a learning curve but the most things work with drag & drop. WebSite x5 allows you add a blog, an online shop, feature rich forms with validation, insert videos, html 5 animations, very impressive picture galleries and much more. You don’t need to be an expert to work with the program which allows you to concentrate on your main business. To develop a page by manual coding and using scripts might give you a little bit more freedom and more control over the code, but it also requires a lot of time and learning, which isn’t the right choice for everyone. If you want to create a private web site, a business web site, promote or even sell your products and services but you you don’t want to spent hours of learning and coding, maintaining an Online solution or even want to save the costs of database based hosting then WebSite X5 may be the perfect solution for you. Create professional web sites offline in the comfort of your own PC and in your own time without having to loose time and focus on your core business. 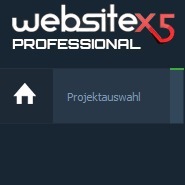 WebSite X5 has a very clean and easy to use interface with a lot of functions and you don’t need to be a professional to get professional looking web pages, so why not give it a try.